To select the right difficulty level of the trip is one of the most important conditions assuring your well-remembered and well-enjoyed holidays. The difficulty level does not depend only on the total mileage of the entire trip, surface of the roads, but primarily it depends on the altitude profile of the daily stages. A trwordsained biker can also go on an easier tour and add some side trips around the neighboring areas. The same way, little less fit bikers can get through the more difficult parts by riding our descriptionompanying car (for more see Tour organization). Easy – The routes are suited for recreational bikers but even for "enthusiastic beginners". It follows a downstream course of a river and terrain is mainly flat with only a few easy hills here and there. Average daily distance is about 40 km. Moderate – This kind of tour is designed for recreational bikers with basic level of fitness, who are used to bike regularly at home. Daily average is around 50 km with no more than two demanding days. Most of the terrain we ride on is moderate. Strenuous – You should have a good fitness and biking experience to enjoy this type of tour. 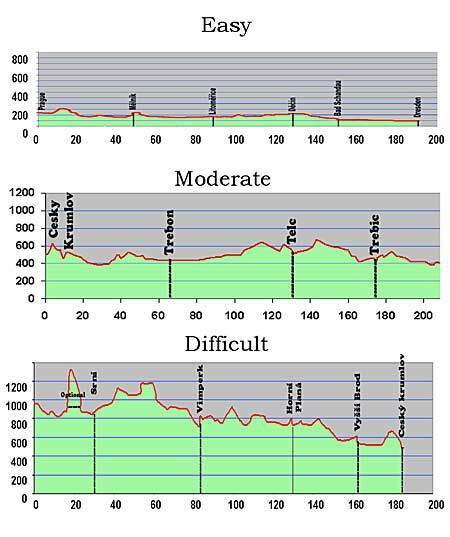 The terrain is mainly hilly with only 1 or 2 easy days but even the average cyclist in good condition can handle it.